You know, photographing tea isn’t too hard. I wish more review sites did it instead of co-opting pictures from the tea distributors’ and/or tea blenders’ sites, but that’s just me. This isn’t the best of quality; simply my iPhone underneath near-natural lighting. Anyways: Strawberry Pepper. This may seem like a rather strange combination, but it works. The sweet slight tartness of strawberries (real pieces, dried, as well as flavoring infusing the tea leaves) combined with the slight bite of pink peppercorns—which aren’t anything like, or even related to, most peppercorns—brings out the best in each flavor. Why? It seems magical to me; perhaps it’s like melody and counter-melody in music. However, and most unfortunately, this is counterbalanced by an unfortunately bland harmony. I must be developing either a tea palette or a tea snobbery, because I can now taste the differences between the base of a black tea, and it’s only a bit above mediocre in this otherwise fine tea blend. 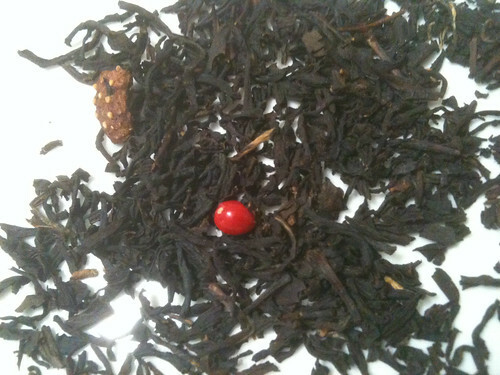 Curiously, a similar strawberry blend has popped up elsewhere, and I may partake of it to see if the tea is fine, or if it’s traditionally such that less fine teas are popped in for a flavored tea. Harney & Sons don’t seem to skimp in this manner, but perhaps it’s just par for the course in the tea blending world. Rating: 3/5—we may part, but it’ll be on amicable terms.